The mortal enemy of long horns and legs is vertical parallel openings in heavy use areas of cattle work. When open vertical spacings connect with horizontal livestock movement, it may not be a pretty thing. Bry Chute and Crowding Panels eliminates the vertical "traps" that have caused over 90% of livestock handling accidents; not just damage to cattle, but handlers who reach through tight verticals for vaccinations and health procedures. Please check out the DCCI safe horn designs attached. No other system is available just for the longest horns -- always think safety. Beyond the BRY CHUTE, the design for an extra strong companion-quality corral panel is finally complete. It is the BRY Crowding Panel. As with the BRY Chute, it easily and safely accommodates wide horned cattle. This same design also makes the flow of all cattle breeds safer when being squeezed, loaded or confined into an area they may fear. This is not an imported "beer can" thick panel that can be carried under one arm. The BRY Crowding Panel has optional hinges and the first changeable/reversible bolt latch. 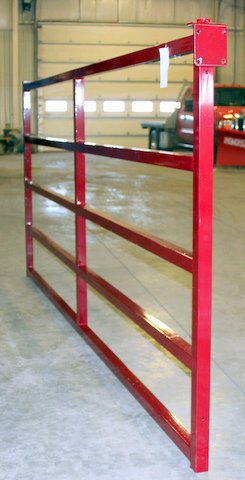 It converts from a temporary corral panel, to a permanent sturdy chute alley, to a 180 degree swinging gate. Panels are with or without 1" bolt latches and 180 degree hinges for maximum versatility. 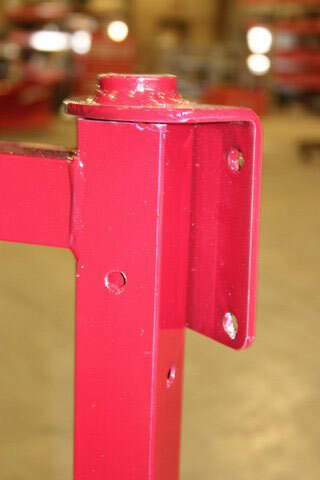 The Bry Crowding Panel is Hi Tensile steel, 14 ga. 1-3/4" square tubing. Hi Tensile steel is 65% stronger than mild steel which is used by most panel manufacturers. Square tubing is 47% stronger than round tubing. Panels are 8' 10' or 12' long and 52" tall. When installed 12" above ground the full height can be 64." The Bry has pre-drilled bolt holes for permanent post attachment using 3/8" bolts or screw-in lag bolts. 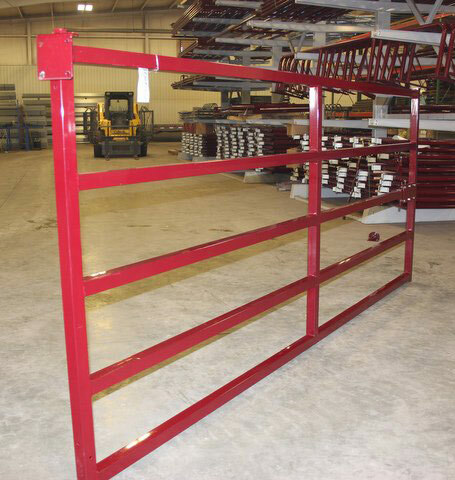 The BRY Crowding Panels allow a smooth horizontal flow of all types of cattle with no vertical parallels to cause appendage hang-ups or breakage. The total horizontal connection design makes the BRY safer for all horned cattle during crowding. The BRY can resist large amounts of stress from rough stock without damage. The optional smooth-turning BRY hinge can be welded to steel or bolted to strong wooden posts. 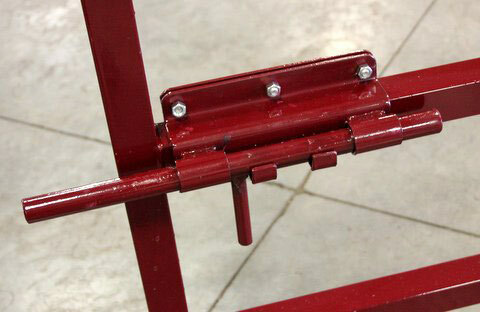 The new 3000 lb test design, 1" bolt latch may be attached up, down, or either side, at any height convenient, or totally removed. The BRY Crowding Panel is a completely welded unit that is nearly indestructible. BRY's are dip coated burgundy with all inside and outside surfaces coated.When you are tired of the cheap stuff, and want something built stronger, to last longer -- choose the BRY SYSTEM.